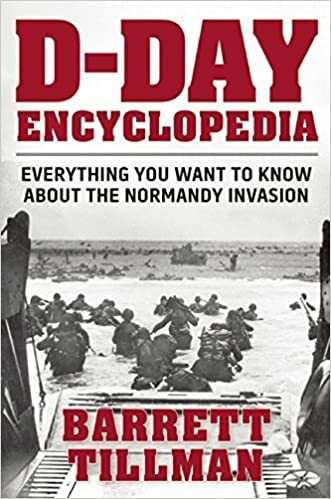 The following article on D-Day generals is an excerpt from Barrett Tillman’ D-Day Encyclopedia. It is available for order now from Amazon and Barnes & Noble. Born in Texas and reared in Kansas, Eisenhower graduated sixty-fifth in the West Point class of 1915. It was called ‘‘the class the stars fell on’’; including Eisenhower and Omar Bradley, sixty-one of the class’s 164 second lieutenants achieved general-officer rank during their careers, an astonishing 37.2 percent ratio. Lieutenant Eisenhower was assigned to San Antonio, Texas, where he met Mamie Doud, whom he married in 1916. During World War I Eisenhower was largely engaged in training units of the U.S. Army’s nascent tank corps. However, his considerable administrative and political skills were soon noted, and he was promoted to major in 1920—a rank he held until 1936. ‘‘Ike’’ was first in his Command and Staff School class, and he was an early selectee for the Army War College. His supporters and contemporaries included leaders such as Douglas MacArthur, George C. Marshall, Leonard T. Gerow, and George S. Patton. Interwar assignments included duty in the Panama Canal Zone and France before joining MacArthur’s staff in Washington and the Philippines, where the former tanker and infantryman learned to fly. 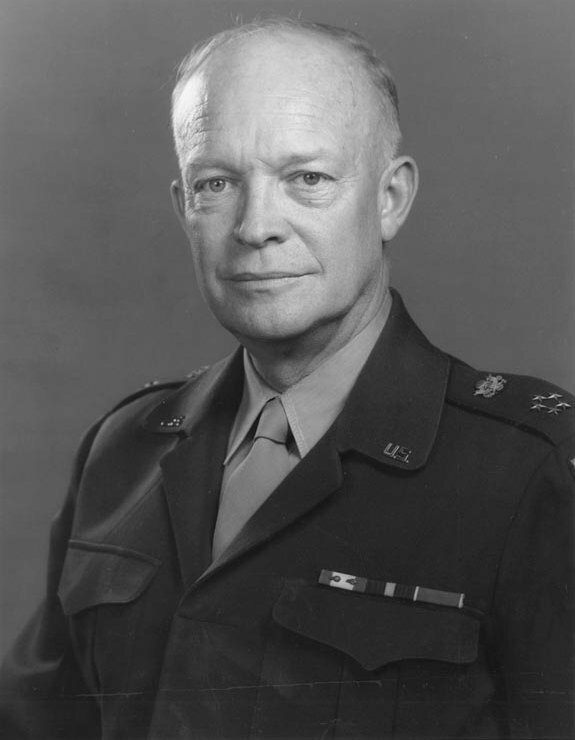 MacArthur said of Lieutenant Colonel Eisenhower, ‘‘This is the best officer in the army’’ and predicted great things for him. Such praise from the megalomaniacal army chief of staff was almost unprecedented. In 1940–41 Eisenhower commanded a battalion of the Third Infantry Division and served as division and corps staff officer. He was promoted to full colonel in March 1941, and as chief of staff of the Third Army he enhanced his reputation during extensive maneuvers involving nearly half a million troops in Louisiana. By year end he was a brigadier general— exceptional progress, considering that he had been a major for sixteen years. In the War Plans Division, Eisenhower renewed his acquaintance with Marshall, then chief of staff, reporting to him on plans and operations. Within a few months Eisenhower pinned on his second star and was addressing joint operations with the navy and other Allied forces. The foundation was being laid for Eisenhower’s eventual appointment as supreme commander for the invasion of France. Meanwhile, Eisenhower represented the United States during British planning for bringing American forces in the United Kingdom. In June 1942 Eisenhower was appointed to command U.S. Army forces in the European Theater of Operations, but almost immediately he moved to the Mediterranean to conduct offensives in North Africa and Sicily during 1942–43. There he gained greater knowledge of U.S. and Allied forces and personalities, including Air Chief Marshal Arthur Tedder, Adm. Bertram Ramsay, and Lt. Gen. Bernard Montgomery. As a lieutenant general, Eisenhower commanded the Allied invasion of French Morocco in November 1942, pursuing the campaign to completion six months later. By then he was a four-star general, directing the conquest of Sicily in the summer of 1943 and landings on the Italian mainland that summer and fall. He was appointed Allied supreme commander for Neptune-Overlord on Christmas Eve of 1943 and, after extensive briefings in Washington, he replaced Britain’s Lt. Gen. Frederick Morgan at COSSAC, establishing SHAEF headquarters in London in January 1944. Many of the American and British commanders he had known in the Mediterranean assumed crucial roles in SHAEF, enhancing Anglo-American coordination. Still, it was no easy task. Apart from Marshall (who had been promised the slot by President Roosevelt), Eisenhower may have been the only American who could have operated the sometimes testy coalition so well. (Assertions that the Allies might have fallen out except for Eisenhower’s acumen are gross exaggerations; Britain was in no position to conduct the war alone.) Relations with Montgomery were particularly strained at times, but U.S. dominance in manpower and materiel required an American as theater commander. Though criticism was leveled at Eisenhower for his lack of combat experience and his highly political orientation, the results proved the wisdom of his selection. He was, after all, manager of perhaps the most political coalition of all time, involving as it did military and diplomatic relations with the Soviet Union. Eisenhower toured the Normandy beaches shortly after D-Day, observing the massive movement of U.S., British, and Canadian forces driving inland. He was awed seeing firsthand the necessary logistical network, such as the Pluto Pipeline. He was accompanied by his son John, a newly minted second lieutenant who had graduated from West Point on 6 June. As the AEF rolled across western Europe, Eisenhower had to balance Allied priorities rather than pursue American interests. Anglo-American fortunes under Eisenhower were almost uniformly successful, excepting the ill-fated airborne assault into Holland in September and the surprise German offensive in the Ardennes in December. At year’s end Eisenhower was promoted to General of the Army. He was Time magazine’s Man of the Year for 1944 and again received the accolade as president in 1959. Despite his demonstrated success, Eisenhower’s overall strategy has been criticized. He seemed to lack a grasp of Blitzkrieg warfare—as practiced by such aggressive commanders as Joseph L. Collins and George S. Patton— in favor of a more measured approach. In focusing on destruction of the Wehrmacht, he missed opportunities to isolate major portions of the German army from Hitler and thereby hasten the end of the war. Immediately following Germany’s surrender in May 1945, Eisenhower was faced with Soviet intransigence in not releasing Allied POWs ‘‘liberated’’ from German prison camps. He made at least one effort to convince the Truman administration to press the matter with Premier Joseph Stalin, but upon being rebuffed, he acceded to his superiors’ wishes. Consequently, thousands of American and other POWs remained Soviet pawns and hostages. Similarly, Eisenhower was accused of knowing about maltreatment of German prisoners, but evidence indicates that the deaths of large numbers of them had been due to insufficient food and shelter rather than a policy of eradication. Returning to the United States in June, Eisenhower was feted wherever he went. He became army chief of staff later that year, succeeding George Marshall, and oversaw demobilization of millions of soldiers. He retired in 1948, became president of Columbia University, and wrote a best-seller, Crusade in Europe. Eisenhower’s retirement was short-lived. He was recalled to active duty during the Korean War, commanding NATO from 1950 to 1952. However, the politically astute supreme commander already had been mentioned as a potential presidential candidate. He declared himself a Republican and was elected thirty-fourth president of the United States in 1952. His immediate priority was concluding an armistice in Korea, which was accomplished in July 1953 with back-channel threats to use nuclear weapons. However, as commander in chief he was again faced with prospects of communist refusal to repatriate all POWs, and he may have left as many as eight thousand U.S. and United Nations personnel in captivity because the Chinese and Soviets would never admit to holding them. Eisenhower was reelected in 1956. He left office in January 1961, succeeded by another World War II veteran, John F. Kennedy. Finally retired in fact as in name, he lived in Pennsylvania and wrote three more books, including the popular At Ease: Stories I Tell My Friends (1967). Eisenhower was portrayed by Henry Grace in The Longest Day. Grace, who was cast in the part because of his resemblance to Ike, appeared in no other films, though he was a set designer for more than twenty years. Born into the large family of an Anglican bishop, Montgomery adopted a strict regimen that remained with him throughout his life. A teetotaler and nonsmoker, he was always known as a hard worker in any endeavor. He married at thirty-nine but lost his wife after barely ten years, being left with a son. Montgomery entered the army in 1908 and served in France, where he was badly wounded. The appalling waste of men and materiel he saw in the Great War profoundly affected his military philosophy, and he applied himself assiduously to improving the British army. He attended staff college and gained some notoriety by rewriting the infantry training manual. At the outbreak of the second war Montgomery was a major general commanding the Third Infantry Division, evacuated from Dunkirk in May 1940. Montgomery’s talents were well spent in training programs over the next two years. He combined physical conditioning with mental toughness and was considered ruthless in weeding out substandard officers. Though he was involved in planning the disastrous Dieppe Raid of August 1942, he was posted to the Middle East before it was executed. Now a lieutenant general, Montgomery assumed command of the Eighth Army that summer and immediately made his presence known. He enjoyed mixing with his troops, believing that combat soldiers should see their commander as often as possible. Subsequently Montgomery participated in the Sicilian campaign, clashing with his American Allies more than once. His fabled rivalry with Gen. George Patton was born in Sicily, though the Briton was usually one echelon above Patton (i.e., corps to army, army to army group). Next Montgomery led the Eighth Army into Italy in September, remaining until year’s end, when he was recalled to Britain. 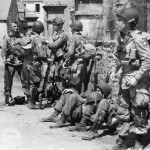 In preparation for D-Day, Montgomery was given a dual responsibility— command of Twenty-first Army Group and overall Allied land commander for Overlord. As in Africa, he made a point of visiting each major command so he could see and be seen by the troops. 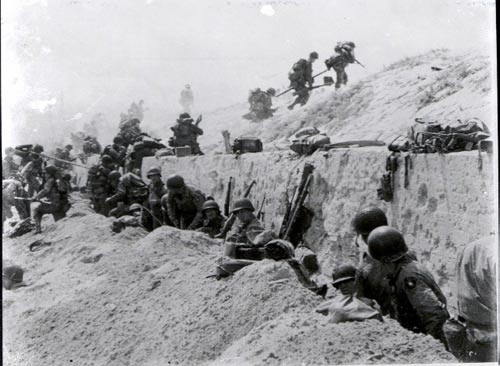 Despite his usual caution and frequent personality clashes, he shared Eisenhower’s decision to launch the invasion on the night of 5 June (see: D-Day Timeline: The Invasion of Normandy). The difference was that Eisenhower reluctantly did so; ‘‘Monty’’ was eager to step off, regardless of weather. Montgomery went ashore on D+2, directing his formations toward Caen, which he pledged to deliver in days but that resisted for a month. Meanwhile, Gen. Omar Bradley’s Twelfth Army Group with Patton’s new Third Army broke out of the landing area, beginning an encirclement of major German forces in the Falaise pocket in August. Simultaneously Montgomery conducted a methodical advance toward the vital port of Antwerp, Belgium, and advance that took three months. Even then, German command of the Scheldt Estuary prevented Allied shipping from offloading until near the end of November. Consequently, Anglo-American logistics were complicated beyond expectations, and in September Eisenhower assumed the role of ground commander, a move the Briton resented. Nevertheless, Montgomery was promoted to field marshal in September; he became more intransigent. He insisted on a northern thrust into Germany, with his Twenty-first Army Group receiving most of the fuel and supplies available to the Allied Expeditionary Force. Bradley continued his advocacy of a broader approach, maintaining pressure along the front and seeking or creating greater opportunities. Montgomery’s firm advocacy gained sway, however, leading to Operation Market-Garden, the daring but disastrous air-ground attack in the Netherlands. During Germany’s surprise attack over the Christmas season in the Ardennes, the Allies were hard pressed to contain the early advances. Because Montgomery assumed command of most American units north of the ‘‘bulge,’’ he publicly claimed that he had ‘‘saved’’ the U.S. force from destruction. He made a bad public relations situation worse by insisting that he regain his role as overall ground commander, but he soon realized he was fighting a losing battle. Subsequently he served well as Eisenhower’s subordinate. Following Germany’s collapse Montgomery was named commander of the British occupation forces. A year later he became his nation’s senior soldier, as chief of the Imperial General Staff, a post he retained until the end of 1949. He spent most of the next decade as Supreme Allied Commander in Europe, leading NATO in the depths of the Cold War. In 1946 he was created Viscount Montgomery of Alamein. Montgomery retired in 1958 and devoted much time to writing. His self-serving Memoirs did little to endear himself to his former American colleagues. Some Britons also expressed dissatisfaction, most notably Adm. Sir Bertram Ramsay, who faulted Montgomery for the delay in seizing the approaches to Antwerp. Bertram Home Ramsay enjoyed two careers in the Royal Navy, serving in both world wars. The son of an army officer, he joined the navy in 1898, at the age of fifteen. During the First World War he spent much of the conflict conducting the Dover patrol, attaining the rank of captain. He improved his professional standing with tours at Naval War College in the late 1920s and the Imperial Defense College during the early 1930s, his studies alternating with normal career duties. Ramsay remained on active duty until 1938, when he retired as a vice admiral. However, his experience was badly needed when war began, and he was recalled to the colors. He found himself in familiar waters as Flag Officer Dover, and in that capacity he oversaw the tremendously difficult evacuation of British and French forces from Dunkirk in May–June 1940. The rescue of 338,000 allied troops brought Admiral Ramsay immediate attention; he was knighted for that contribution to Britain’s defense. Though still officially on the retired list, Ramsay was second in command of the British portion of the North African landings in Morocco during November 1942. His contribution to Operation Torch included a significant amount of the planning, and he was partly responsible for coordinating the staff work of the British and American navies. Ramsay’s previous experience was particularly helpful here, as he had been among the first in the Royal Navy to qualify as a staff officer. He continued his joint operations success in helping plan Operation Husky, the invasion of Sicily in July 1943. 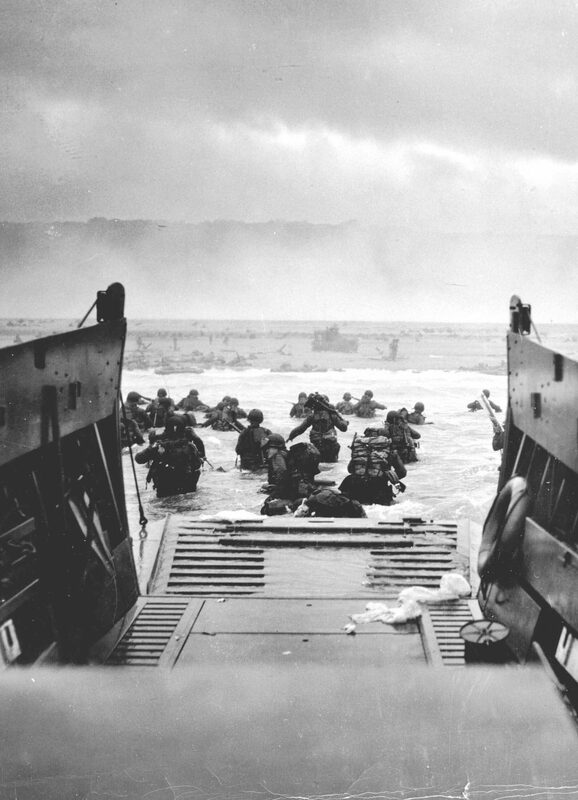 During the landings he commanded one of the amphibious task forces. By the end of 1944 Ramsay had moved his headquarters to Paris, where he could better conduct seaborne support of the advancing allied armies. On January 2, 1945, he was traveling to a joint-service conference when his aircraft crashed on takeoff. Admiral Sir Bertram Ramsay was sixty-two years old. He was briefly portrayed by John Robinson in The Longest Day. Trafford Leigh-Mallory earned a Cambridge honors degree in history before joining the army. He transferred to the Royal Flying Corps in 1916 and commanded an observation squadron in 1918; one of his pilots received the Victoria Cross. 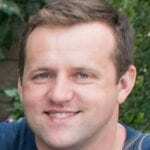 Leigh-Mallory’s leadership style was regarded as somewhat abrasive, but he proved he could get results. After the war he continued in Army Co-Operation Command, but his ambition was well known; he was regarded as an astute service politician. By 1940 Leigh-Mallory was an air vice marshal commanding No. 12 Group of RAF Fighter Command. Based on airfields north of London, 12 Group was dedicated to defense of the industrial Midlands as well as protection of convoys off Britain’s central east coast. Leigh-Mallory’s advocacy of ‘‘big wing’’ tactics to inflict maximum damage on the Luftwaffe resulted in serious disagreement with Air Vice Marshal Sir Keith Park, his opposite number in No. 11 Group. Park’s squadrons, based in Kent and along the south coast, relied on No. 12 Group to cover their fields while they intercepted inbound raids. The extra time necessary to assemble big wings often meant damage to No. 11 Group bases. After the Battle of Britain, LeighMallory’s political influence brought him command of No. 11 Group, with the transfer of Park to the Mediterranean and the retirement of Air Chief Marshal Sir Hugh Dowding as Fighter Command’s leader. Leigh-Mallory worked closely with Dowding’s successor, Air Chief Marshal Sir Sholto Douglas. They initiated an offensive policy, sending fighter sweeps and bomber escorts over France. Such an operation during the Canadian amphibious raid on Dieppe in August 1942 prompted one of the largest air battles of the war. On 30 May Leigh-Mallory confided his doubts about the wisdom of the U.S. airborne phase of the invasion. Concerned about what he considered unsuitable landing grounds and German strength in the drop zones, he envisioned ‘‘a futile slaughter of two fine divisions.’’ Leigh-Mallory estimated casualties of 50 percent among paratroopers and 70 percent among glider infantry, losses that would leave the survivors too weakened to hold out until relieved by Americans from Utah and Omaha beaches. Eisenhower considered the prospects soberly but decided that previous experience did not support so pessimistic an assumption. Consequently, he telephoned Leigh-Mallory and subsequently sent him a letter confirming the decision to drop as planned. Eisenhower’s judgment was proven correct; though the airborne troopers were badly scattered, their casualties were sustainable. In November 1944 Leigh-Mallory was named commander in chief of the Southeast Asia area of operations. On takeoff from England his transport plane crashed, and Leigh-Mallory was killed.